It started when one of my friends made a 00 model using a Bachmann GE44 bogie loco chassis - the shortest US bogie switcher. It was my first hands-on experience of American models, but not my last. Impressed with its neat size and smooth running, I bought one on eBay. It was a 1st generation double-motor unit that I intended to use for Gn15 as either 1 x BO-BO or 2 x 4w models. It was stripped down to assess it's basic dimensions and new loco designs began. However, after cleaning and running-in for a while, what turned out to be a common problem of cracked wheel-drive gears started to appear. I hunted for replacements on-line, but didn't find any. A repair using sleeves over the cracked ends was found online, but I doubted that I was adept enough to tackle the fiddly job. The project stalled. Some time later, with renewed interest, I started tracking replacement gears from non-railway sources. I found it necessary to learn about gear specifications - modules, addendums, dedendums, circular pitches etc., and it made some sense. This knowledge led to thoughts of making them i.e. having them 3D printed, something I'd already done for my own axleboxes. 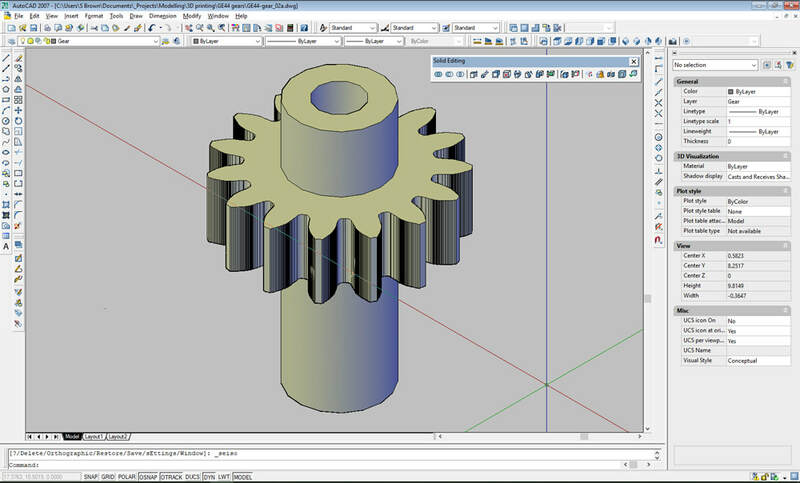 I was able to measure and establish the gear specification, then sat through numerous YouTube tutorials on drawing involute gears. I had no idea if this was actually necessary for such a small gear, but I was determined to get it as accurate as I could. 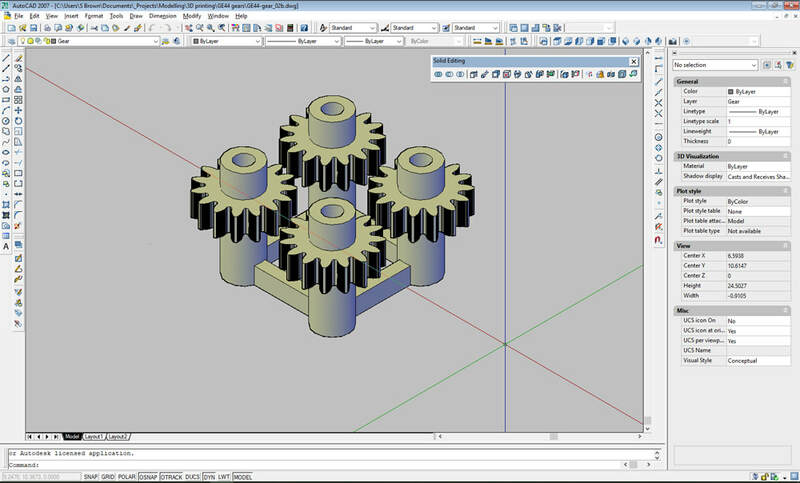 After a lot of practice, a decent looking 3D model was produced that was uploaded to the Shapeways website in Holland. This was immediately confirmed as a viable design, but the individual gear (6mm dia.) was too small for printing. As a loco needed four, a set of four on a sprue was created that passed the test. A friend who'd been successful with 3D printing suggested Ultra Frosted plastic, but this was described by Shapeways as good for fine detail but brittle. I therefore ordered a set in UF and another in Strong and Flexible plastic. A week later, they arrived. Unfortunately, the S&F gears were not suitable as the teeth were not crisply formed enough, but the UF looked excellent. One of the bogies was fitted with the new gears and, much to my surprise, they worked perfectly. It was put on a test track, and has been running for many hours without any problems. 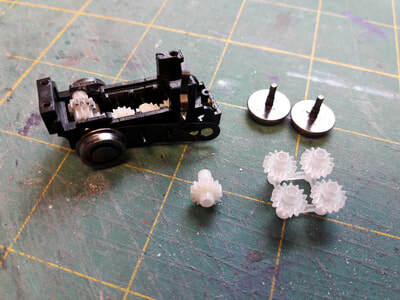 The second bogie upgrade was attempted, but one of the gear sleeves fractured as the wheels were being pushed on and the brittleness was evident. However, the gear itself was intact, so a repair was effected using aluminium tube, as described on the Gn15 blog, and that too is running well. I now have two 4w motor bogies or one BO-BO chassis to find projects for. 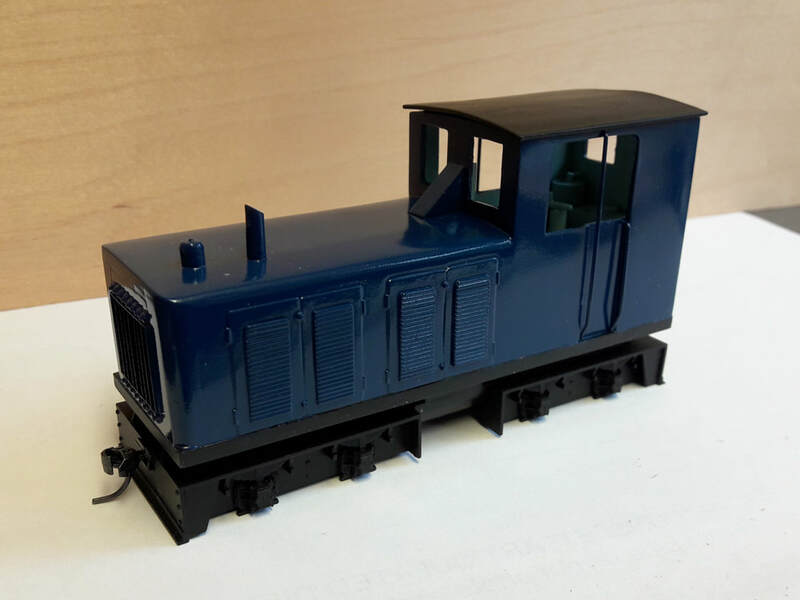 Prior to remedying the problem, and still keen to make use of the lovely little chassis, another GE44 was purchased. This was a single motor unit (2nd generation?) purchased in mint condition on eBay. It was being converted into a 0-16.5 BO-BO diesel based on 'Carnegie', when an accident through clumsy handling caused minor cracking to appear on two wheel gear sleeves. However, for the time being, it still runs well and hopefully, the new gears will be suitable for this version as well. Prior to remedying the problem, but still keen to make use of the lovely little chassis, another GE44 was purchased. This was a single motor unit (2nd generation?) purchased in mint condition on eBay. It was being converted into a 0-16.5mm BO-BO diesel when an accident through clumsy handling caused minor cracking to appear on two wheel gear sleeves. However, for the time being, it still runs well and hopefully, the new gears will be suitable for this version as well. O-16.5mm Diesel based on 18" gauge 'Carnegie' now at Waltham Abbey gunpowder mills. While researching the loco, photos of the 'explosives wagon' were discovered, which became a Gn15 model.